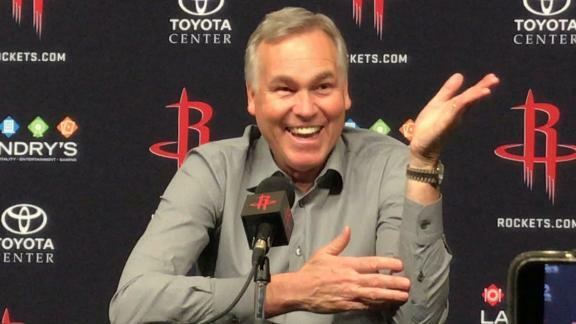 HOUSTON -- Houston Rockets coach Mike D'Antoni found himself in a playful mood after his team extended its NBA-best win streak to nine games Monday with a 118-106 victory over the Charlotte Hornets behind a 28-point night from James Harden. So when the focus shifted toward Wednesday's showdown against the Golden State Warriors, D'Antoni wasted little time delivering a zinger. Asked what he thought of Warriors guard Stephen Curry, mentioning Oakland has "an opportunity to send a statement" against the Rockets after it fell 115-111 on Sunday to the Phoenix Suns, D'Antoni didn't hesitate. 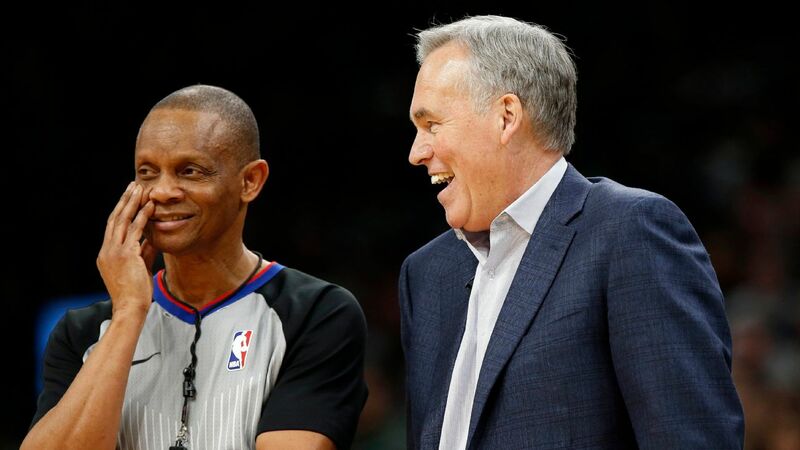 "Yeah, well, they should have probably said it before the game," D'Antoni said, laughing. "I'm sure they are. Why wouldn't they? I'd be surprised if they didn't feel that way. They were going to make a statement. They were going to come out, they were going to play. They probably stated the obvious. If they didn't say anything, I'm sure they're thinking it. You know how today is. Everybody's got something to say. I've got something to say." But if anyone was looking for bulletin-board material headed into Wednesday's clash at the Toyota Center, they certainly wouldn't have found it in the Rockets' locker room after Monday's win over the Hornets. Golden State has dropped six of its past 10 outings, and hasn't captured consecutive victories in almost a month, while the Rockets have racked up a record of 31-11 dating back to December after starting off the season with an 11-14 record. Houston is also experiencing somewhat of a resurgence on defense, having held opponents to an average of 97.8 points over the past five games, after allowing 110 points or more in each of the six outings before. The Rockets have also limited opponents to less than 45 percent shooting in four consecutive games, allowing for a record dating back to last season of 44-9 when they hold opponents to less than a 45 percent clip. Harden quickly pointed to "our defense" when asked about the most positive aspect of the team's current win streak. "We've been guarding, and that's helping us offensively get out in transition and get easy points," he said. What proved difficult, however, was getting Harden to play into the hype surrounding the matchup against the Warriors. Houston owns a record this season of 3-0 against Golden State. "I don't know how they feel," Harden said. "All I'm worried about is what's in this locker room." Point guard Chris Paul also sidestepped the hype concerning the Warriors. "I don't know. We're trying to pile up wins," he said. "Everybody's going to say it's a big game or they'll say it's not, whatever. It doesn't mean anything really until the playoffs. If we beat them three times in the regular season, ain't nobody going to remember in about a month." Asked what Curry's remarks said about how the Warriors feel about the Rockets, again, Paul refused to bite. "A good headline," Paul said. "Win or lose, it's a game. They're not tripping. I mean, they're probably not." What's undeniable, though, is that Houston sees a path, albeit a difficult one, to the No. 1 seed in the Western Conference. Houston is currently 3.5 games back from first in the Western Conference standings with 15 games remaining. "With all the stuff we've gone through, all the ups and downs, starting from 11-14 or whatever after that, we're in a good spot and we still have a chance to legitimate make a run for the first spot," D'Antoni said. "That's pretty good in any year in any scenario, even if we were healthy all year. Especially with teams like Denver, with the way they're playing, and Golden State. Doesn't mean we'll do it because we put ourselves in a hole. We have to have some help. But we've just got to be sure we do our part. If that means our part is third, so be it, or fourth, so be it. But if we get a little help, then we've got a chance." Mike D'Antoni jokes that the Warriors should have discussed sending a statement before their loss to the Suns instead of after.